The Chicago Bears will be just fine if they keep playing like this — and don't lose any more players to injuries. Jay Cutler threw for 188 yards and a touchdown after missing a game because of a concussion, and the Chicago Bears broke it open early in a 28-10 victory over the Minnesota Vikings on Sunday. Injuries to Devin Hester, Matt Forte and Charles Tillman, however, tempered some of the good feelings this win created. Tied with Green Bay for the NFC North lead and just a game ahead of Minnesota (6-5) coming in, the Bears (8-3) grabbed a 25-3 halftime lead with Cutler connecting on just about every pass. The defense held Adrian Peterson in check early on, although he did finish with 108 yards rushing. Chicago also came away with three more takeaways to increase its league-leading total to 30. The rather easy win came after back-to-back losses to Houston and San Francisco that left many questioning how good this team really is. But it also came with a heavy price. The Bears lost Hester early to a concussion and watched as Forte hobbled off the field midway through the third quarter with an ankle injury. Coach Lovie Smith said Tillman also hurt his ankle. Besides those three, the Bears lost both starting guards in the third quarter to knee injuries, with Lance Louis and Chris Spencer going down. 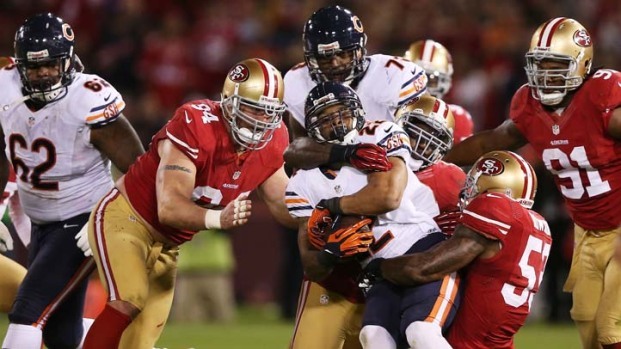 Louis' injury forced Chicago to go with Gabe Carimi after he lost the right tackle job to Jonathan Scott. As for Cutler, he sure looked sharp after missing Monday's blowout loss at San Francisco. Back after being knocked out of the Texans game on a helmet-to-helmet hit by Tim Dobbins, he got off to a scorching start and completed 23 of 31 passes with an interception to go with that touchdown. 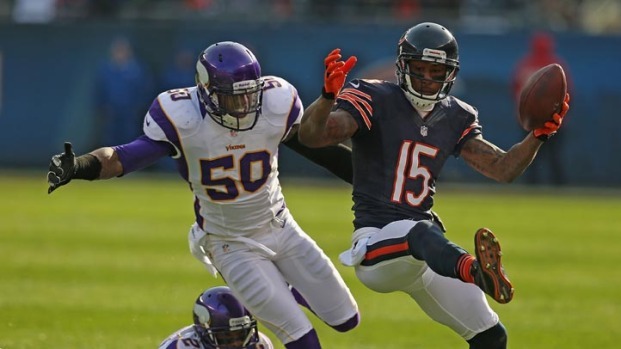 Brandon Marshall caught 18 passes for 108 yards and became the first Bears receiver since Marty Booker in 2002 to go over 1,000 yards. On defense, Henry Melton set the tone by sacking Christian Ponder on the first play from scrimmage. Nick Roach set up the first touchdown by knocking the ball out of Peterson's hands. Chris Conte set another TD with a 35-yard interception return, and Julius Peppers blocked a field goal. The league's leading rusher, Peterson tied Robert Smith's club record with a 100-yard performance for the fifth straight game even though he managed just 25 in the first half. He also lost two fumbles. Ponder wasn't much help, going 22 of 43 with 159 yards and a touchdown along with an interception. His favorite target, Percy Harvin, sat out his second straight game with a sprained left ankle, and the Vikings lost for the third time in four games. Cutler completed 15 of 17 passes for 117 yards in the first half, and the Bears jumped out a big lead after a shaky start on offense. Forte fumbled on Chicago's first play from scrimmage, leading to a 40-yard field goal by Blair Walsh — all the scoring the Vikings did in the half. 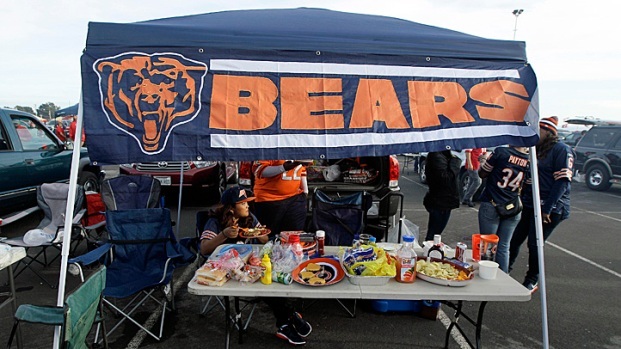 The Bears quickly turned this one around, starting with Roach's forced fumble. They took over on the Minnesota 34, and Michael Bush ran it in from the 1. Chris Kluwe then shanked a 22-yard punt, giving Chicago possession near midfield before Robbie Gould kicked a 47-yard field goal. 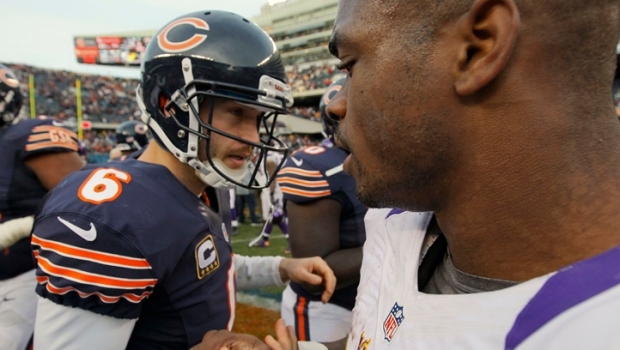 And the Bears stopped the Vikings again early in the second quarter when Peppers knocked down Walsh's 30-yard field goal, the 13th block of his career. Bush, in for Forte, converted on a fourth-down run to keep a drive going and Antoine Winfield shoved Brandon Marshall to the ground as he attempted to catch a pass in the end zone. Bush then scored from the 1, and holder Adam Podlesh ran in for a 2-point conversion that made it 18-3. Ponder got picked off by Conte and he returned it 35 yards to the Minnesota 13. That led to a scoring strike from Cutler to a lunging Matt Spaeth on the next play. It might have been more had Kevin Williams not blocked Gould's 39-yard field goal as the half expired.